When Comic Books Ruled the Earth: Dark Horse celebrates women in comics with a sale! 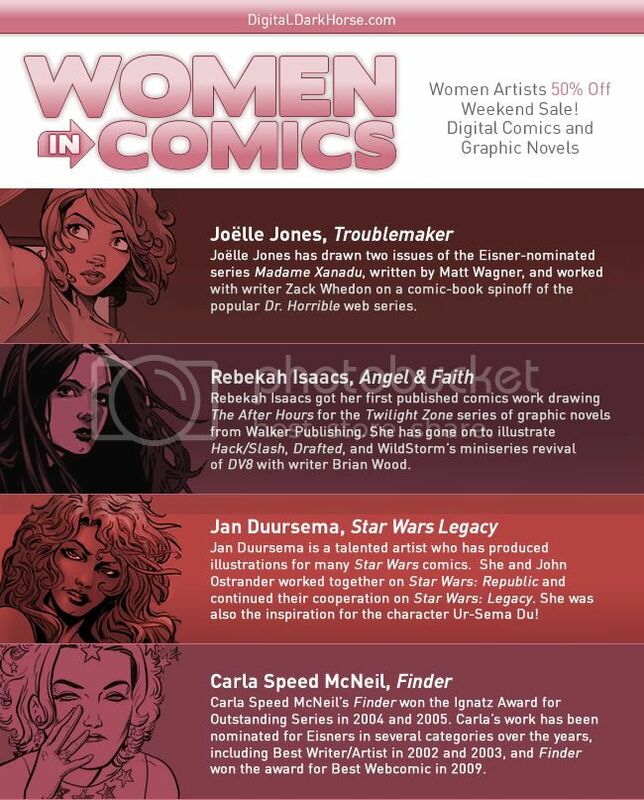 Dark Horse celebrates women in comics with a sale! It's super appropriate because if there's anything women love more than shopping, it's shopping for 50% off items! Right, ladies? This is how my train of thought has been working lately. As my reader no doubt knows, I've been really getting into Creepy magazine which features some of the early editing work of Louise Simonson who went on to shepherd the books that made me the insanely obsessed comic book fan I am today, namely Uncanny X-Men and especially The New Mutants. As such, it's difficult to overestimate Simonson's impact on my pop culture-lovin' life. This extends even to her hair, which apparently made a cameo appearance atop character Maddy Prior in Uncanny X-Men #168, thanks to artist Paul Smith. And via Simonson's The New Mutants I just started enjoying the amazing artwork of both Mary Wilshire and June Brigman. I would have sooner, but they worked on that book after I'd given up comics in favor of being a rock star. And we see how well that's worked out for me! To connect this back to Dark Horse, it's mainly due to Dark Horse's Creepy reprints I owe this belated recognition of some prime movers in my comics consciousness. Dark Horse is the once and future home of my all-time favorite series, Nexus. When I discovered Nexus, the editor of record was the amazing Anina Bennett, whose letter column replies to all sorts of controversies never failed to impress me with her candor, intellect and willingness to mix it up. I always felt confident Mike Baron and Steve Rude were in good hands with Bennett. And she's a creator in her own right, too. And even though Dark Horse rejected my own little effort at getting into print, that's one comic book company that hasn't disappointed me. From Nexus to Hellboy and points in between, they just keep rocking great product. Publisher Mike Richardson even returned the Nexus rights to Baron and Rude. Think about that during all this talk of boycott and petition signing. A comics publisher that returns rights to comic creators.